If you’re looking for a kid-friendly condominium, Pierhouse is a great option. The new waterfront development holds obvious appeal for grown-ups, who appreciate the well-appointed living spaces and the best views in the city, but it’s the amenities at Pierhouse and in its surrounding neighborhoods that make it a great spot for children and their caregivers. The building features a children’s room with an outdoor play terrace and bicycle storage for all ages. Brooklyn shed its “little brother” complex with Manhattan long ago, but you have to admit that one of the best sights in the borough is the view of the Manhattan skyline from across the bustling East River. 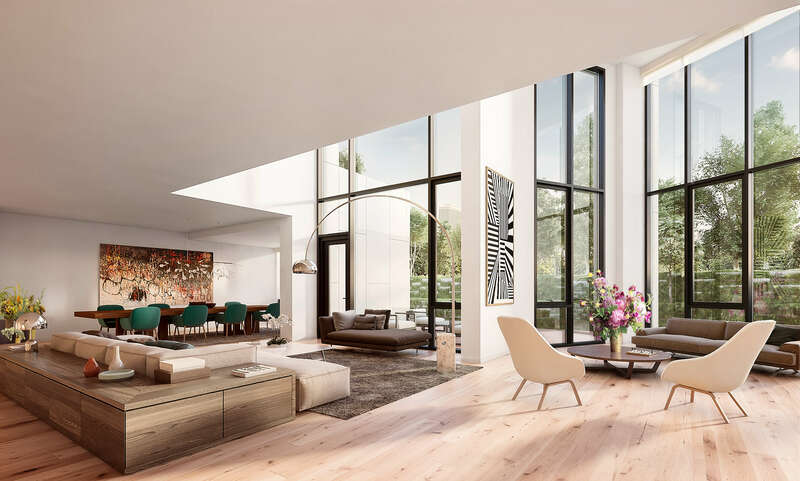 Located immediately to the south of the Brooklyn Bridge, Pierhouse at Brooklyn Bridge Park offers unobstructed views of lower Manhattan, Governors Island, and the Statue of Liberty. Pierhouse sits at the intersection of Dumbo and Brooklyn Heights, situated in the stunning landscape of Brooklyn Bridge Park and within walking distance of some of Brooklyn’s most popular attractions, including The River Café, St. Ann’s Warehouse, the Brooklyn Heights Promenade, and the bridge itself. And then there’s the building itself. Every residential unit is a duplex that faces Brooklyn Bridge Park and Manhattan, with views to the west and the Brooklyn Heights neighborhood to the east. Limestone-clad piers frame the western façade, while playfully tinted panels on the east façade riff off of the colors of Brownstone Brooklyn. The rooftop is made up of private, paved patios interspersed with native grasses and shrubs.